Japanese seed beads with turquoise nuggets and smaller beads. Made bead by beads with a needle. Each one different in size and design. Japanese seed beads, abalone drops and other small beads. 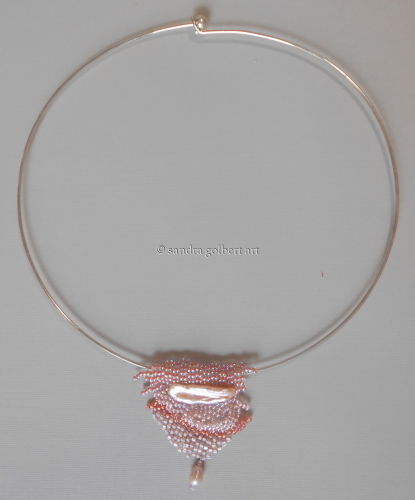 Silver-plated neckring with beaded pendant. 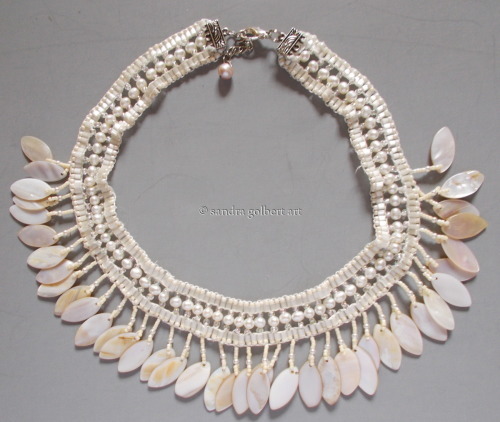 Japanese seed beads and Biwa fresh-water pearls. One size. 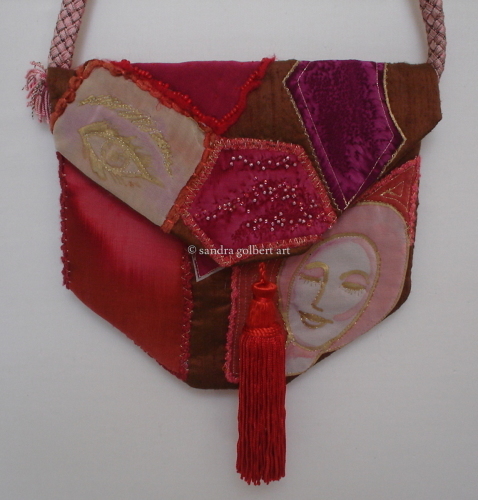 Antique kimono pieces, hand-painted silk, embroidered, beaded, made into evening bag. Tassel closure. Kimono rope strap. 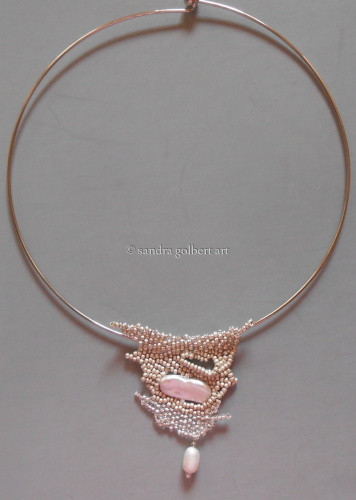 Silver-plated neck-ring with beaded pendant. 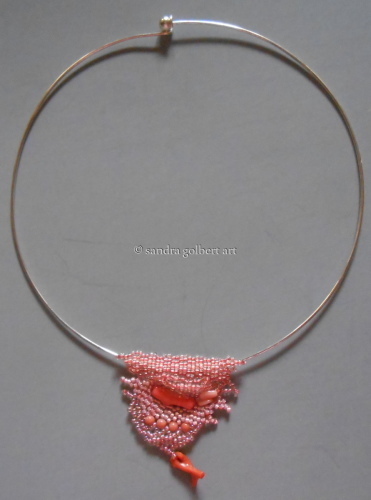 Japanese seed beads and genuine coral. One size. Biwa fresh-water pearls with Japanese seed beads. 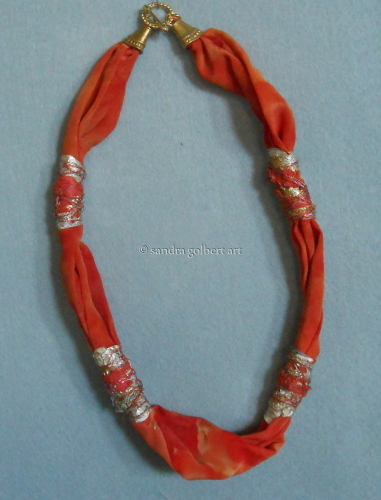 Thread covered 'chain' (available in several colors) with multi-stone beads and charms. 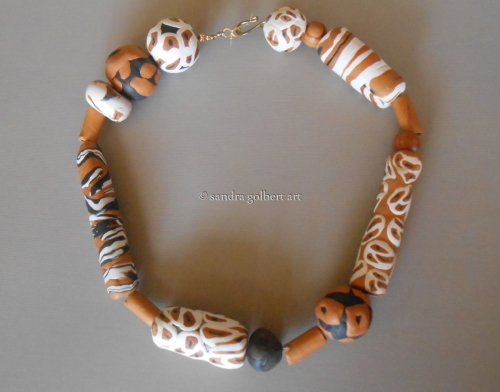 One-of-a-kind necklaces. 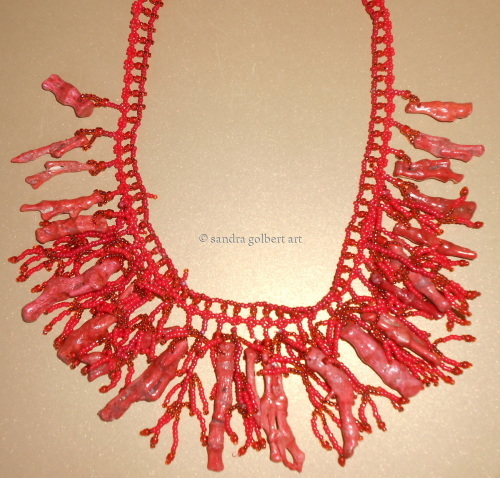 Natural red coral branches with Japanese seed beads. 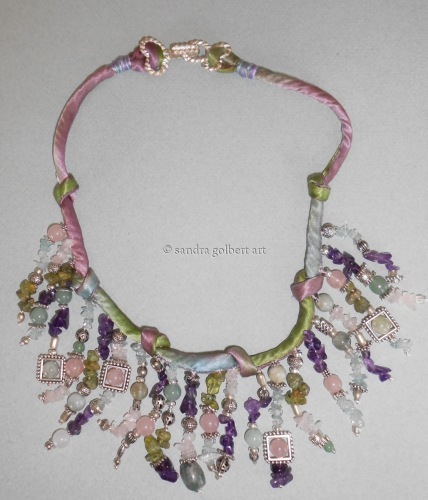 Hand-dyed silk cord, with amethyst, rose quartz, aventurine and aquamarine fringe. Square and round abalone beads with Japanese seed beads. 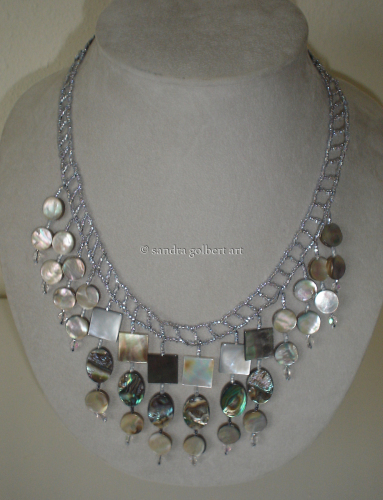 Natural abalone drops with seed beads, pearls and other beads. 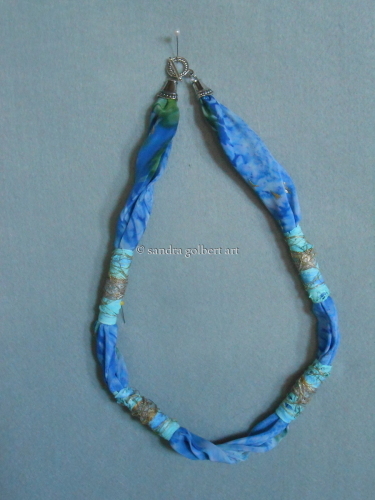 Long necklace, polymer clay leaves with aqua seed beads and other beads. 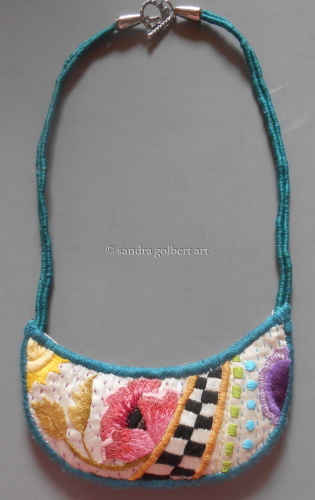 Seed bead ----- with rayon ribbons. Many colors available. pieces, hand-dyed pieces, embroidered, with gold details. Spiky fresh-water pearls with crystal beads. 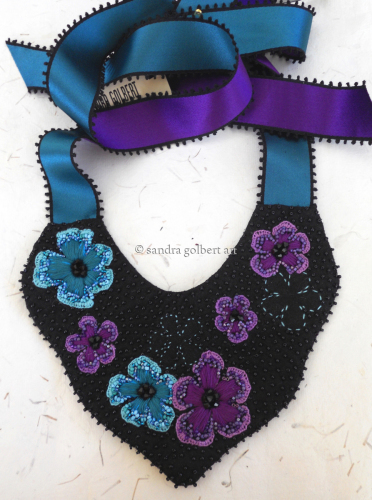 Embroidered, beaded appliqued bib necklace. Black and aqua ribbon tie. 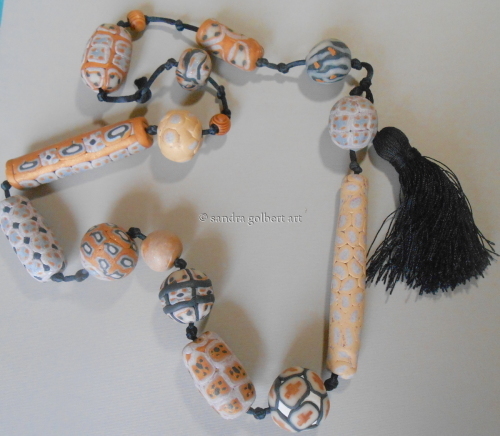 Natural coral, turquoise with Japanese seed beads and other small beads. 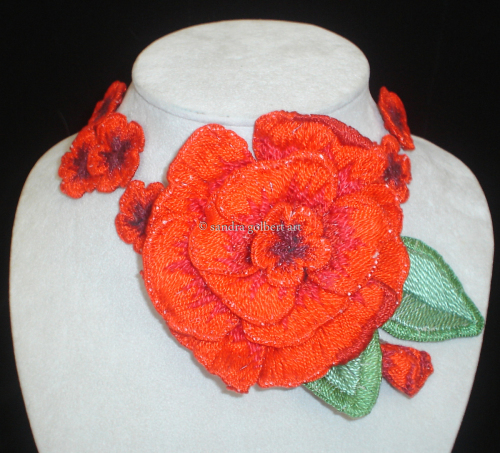 Size: 7.5" - 8"
Embroidered cuff with natural coral, Japanese seed beads and gold accents. Lined with hand-painted silk. 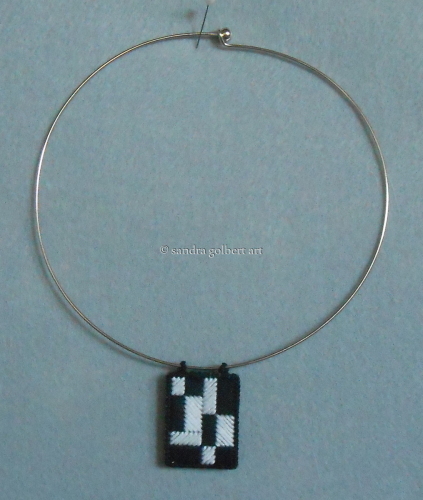 Size: 7" with chain to resize. 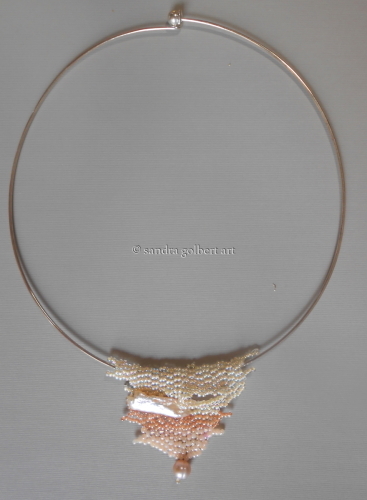 Jewelry felt embroidered with Japanese seed beads, fresh-water pearls with copper coiled wire clasp. Lined with hand-painted silk. 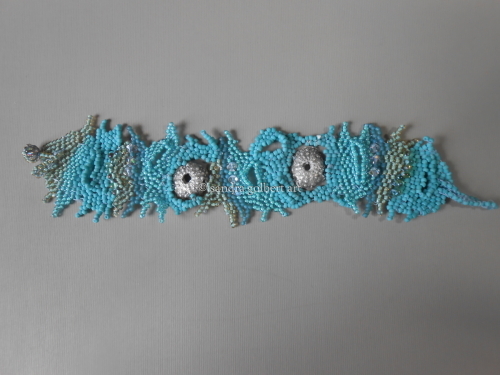 Embroidered cuff with Japanese seed beads and gold accents. Lined with hand-painted silk. 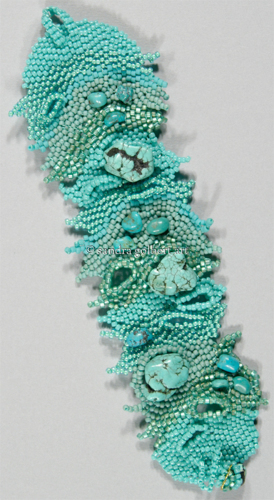 Size: 7.5" - 8"
Turquoise beads, nuggets, Japanese seed beads and cotton perle thread. 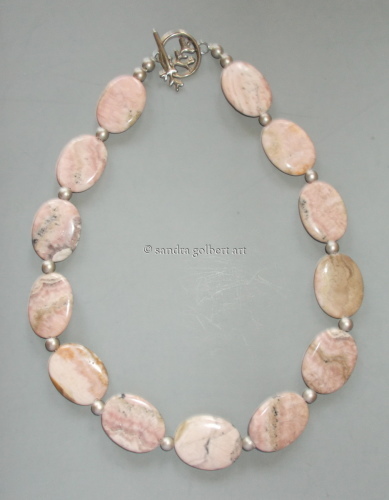 Japanese seed beads, square beads, Biwa fresh-water pearls, 99% pure silver accent. 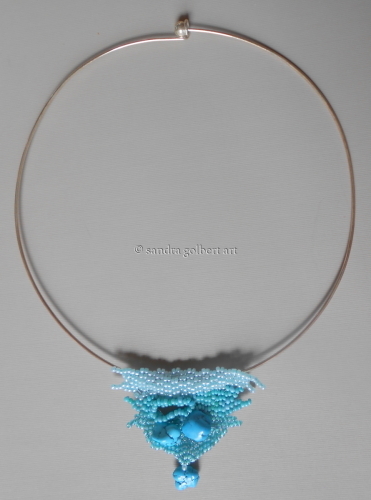 Crystals, Japanese seed beads and cotton perle thread. 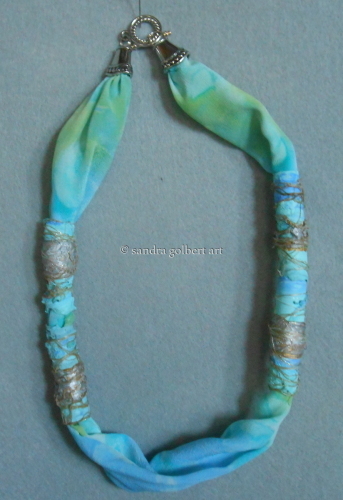 Size: 6" - 7"
Hand-dyed silk with beads made out of Tyvek. 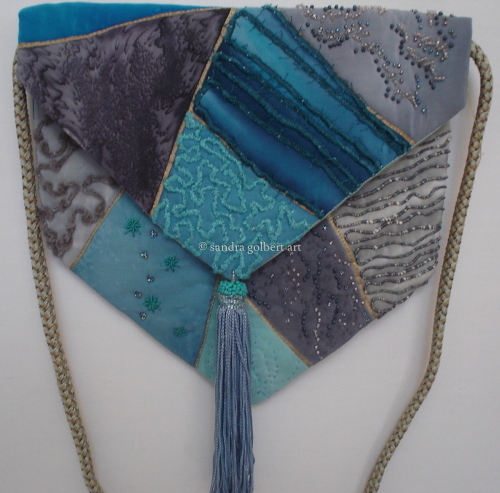 Hand-dyed silk with beads made of Tyvek. 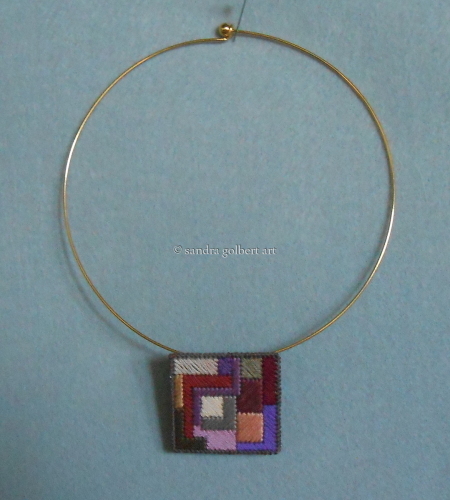 Needlepoint with cotton embroidery thread on neck ring. 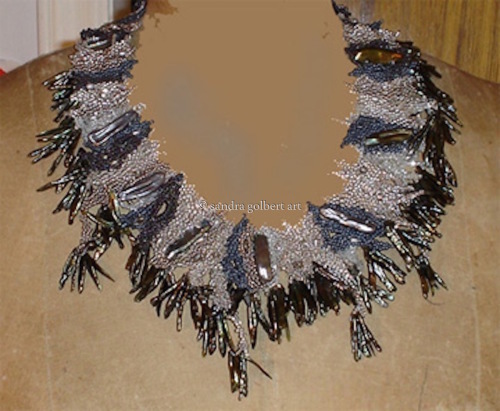 17" choker in hand-made beads. 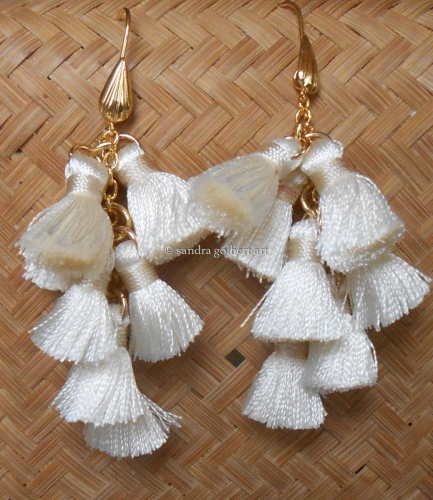 Small ivory-colored tassels. Pierced earrings. 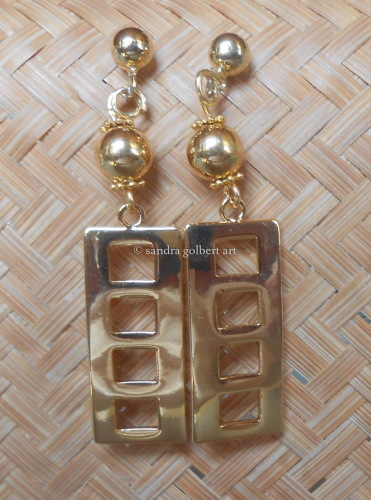 Gold-tone earrings for pierced ears. Ladder design. Beaded bracelet with 99% pure silver molded sea urchins. Tree Bark series. 6 /4" to 7" long. 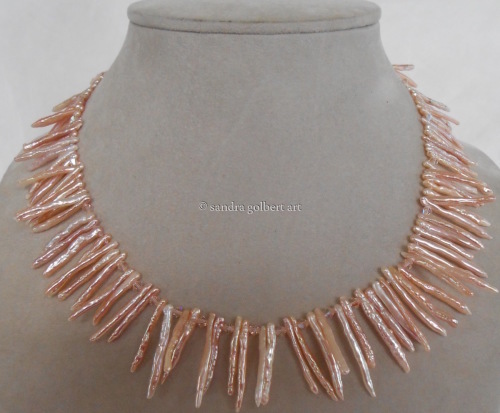 Metallic seed beads and fresh-water pearls. 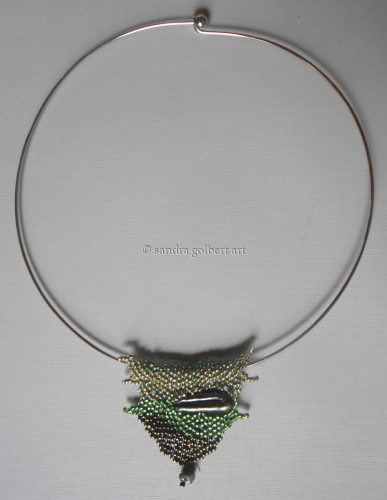 Silver-plated neckring with beaded pendant. 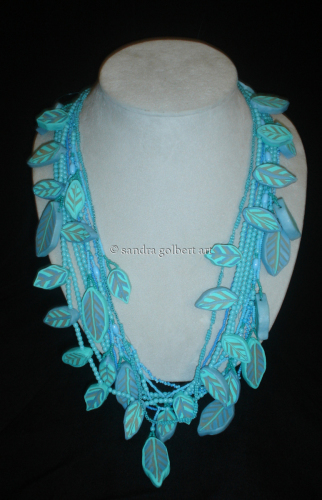 Japanese seed beads and genuine turquoise. One size. 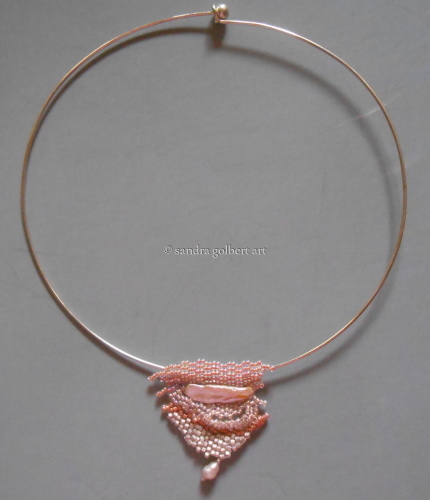 Gold-plated neckring with beaded pendant. 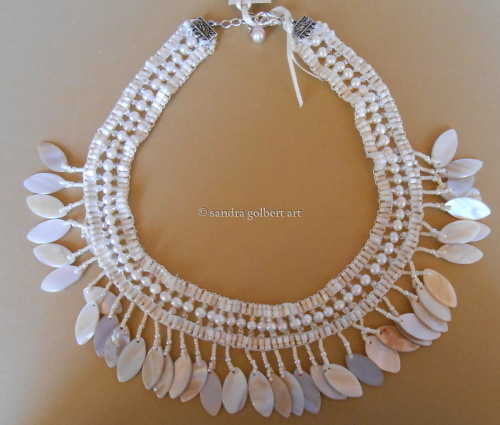 Japanese seed beads and Biwa fresh-water pearls. One size. Beaded pendant with fresh-water pearls in greens. 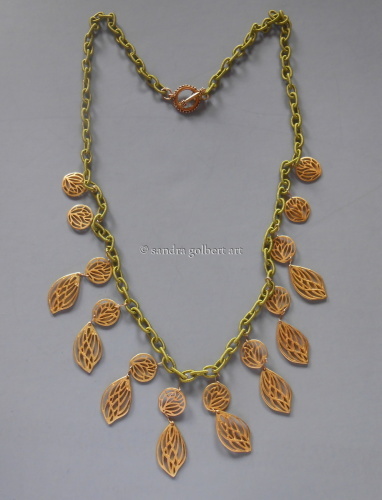 May be ordered in gold or silver plated neck-ring. 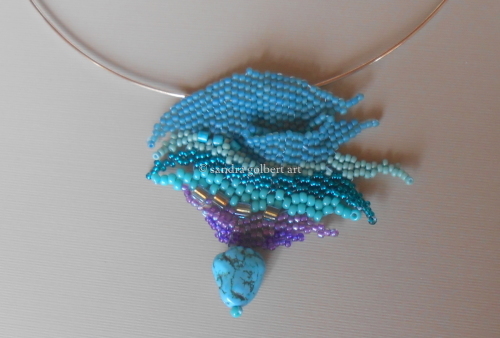 Silver-plated neckring with pendant of turquoise blue Japanese seed beads and genuine turquoise. One size. 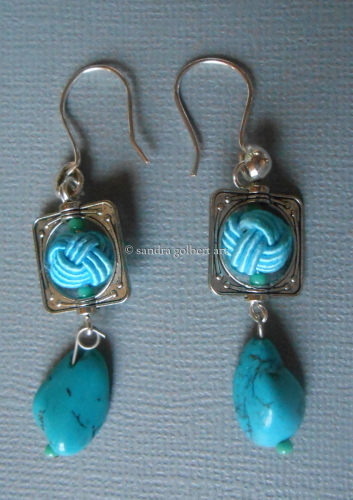 Turquoise drops and knotted cord beads. 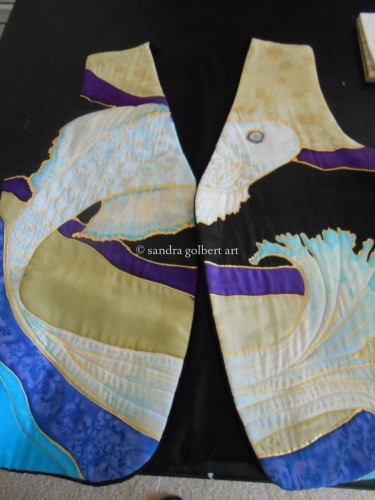 Crescent moon shaped embroidery on silk. 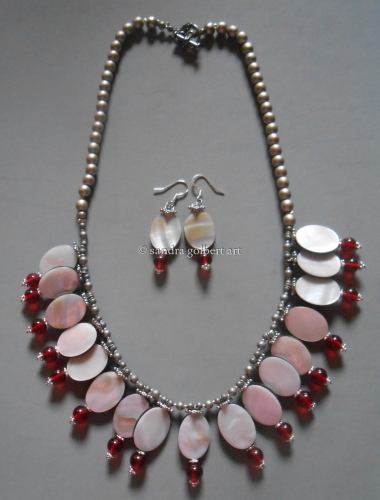 Grey mother of pearl, red glass and silver plated beads. Earrings sold separately. 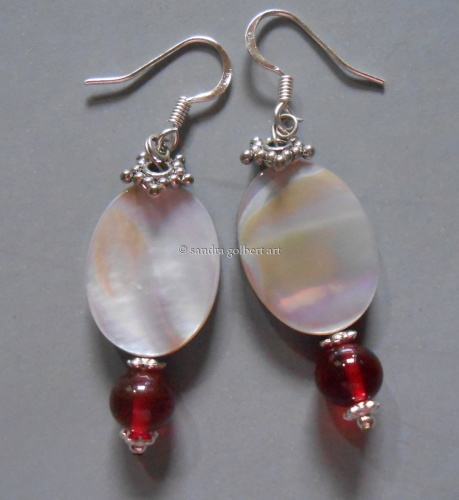 Earrings with grey mother of pearl ovals, silver-plated and red glass beads. 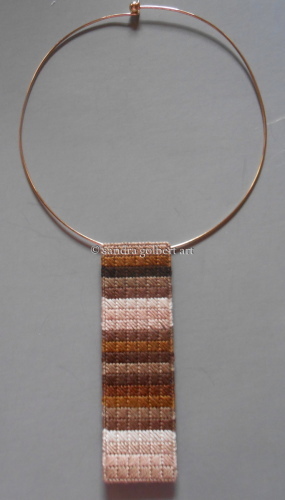 Gold-plated neckring with long pendant in beiges and browns done in needlepoint on canvas. 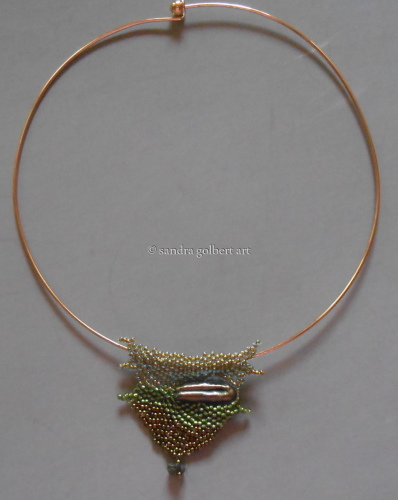 'chain' of olive green rayon covered acrylic. 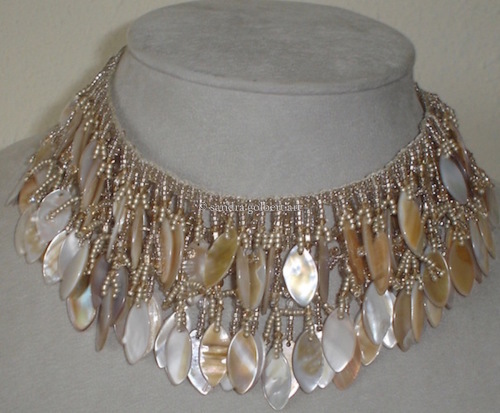 A pearl choker with mother of pearl fringe. 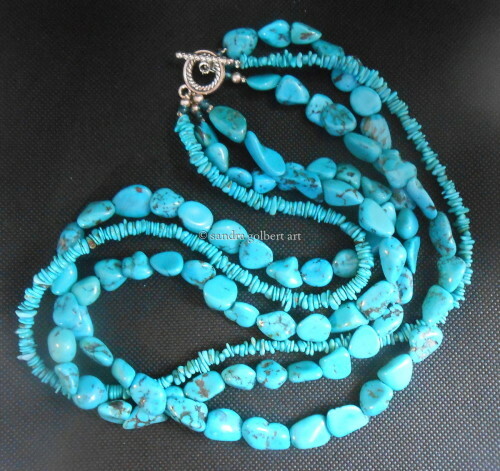 Length: 17" long with extension chain of 2"
fossil beads with turquoise beads and pendant. Silver colored accents. 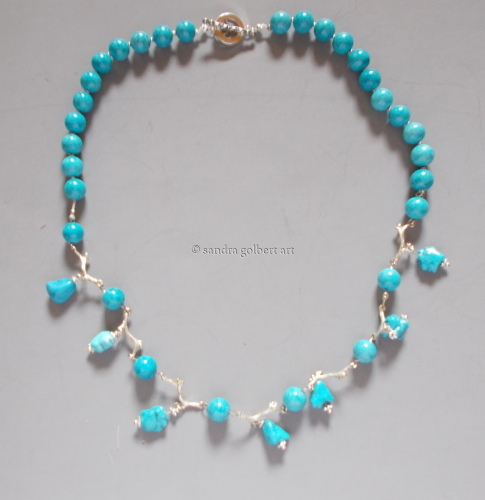 Length: 13"
Nuggets with gold beads and round turquoise clasp. 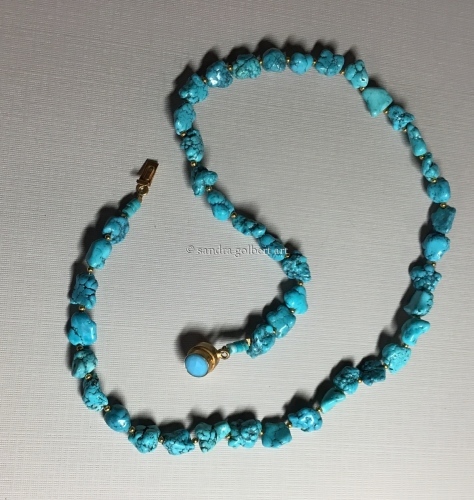 23"
Two turquoise strands of nuggets and one of chips with toggle clasp. 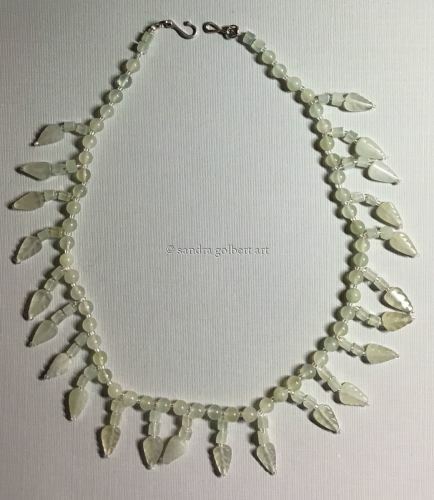 23"
Green aquamarine beads and leaf drops. 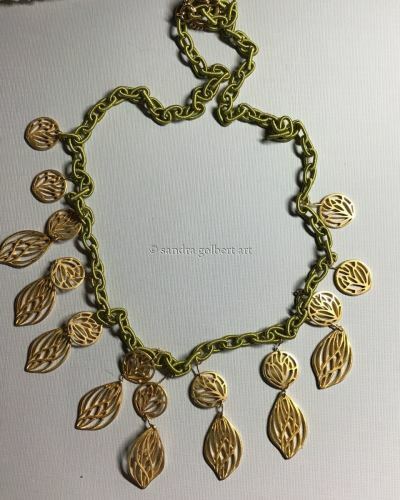 18"
Green rayon chain with leaves. 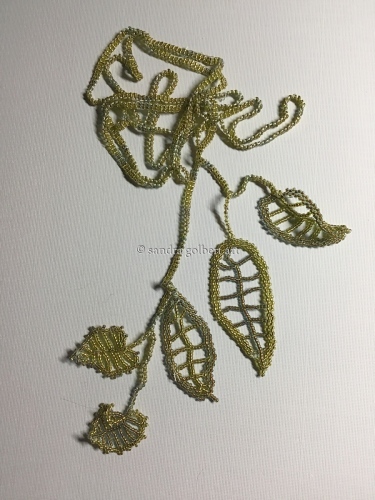 36"
Green beads with leaves at both ends of lariat. Use around the neck twice or hanging loose.